One of those defining facts of life that I learned early on in Italy, was that everyone loves gelato. Rain or shine, tough bikers and housewives alike, winter or summer, havign a gelato is just part of everyday life, a unifying ritual of sorts. This creamy heaven was invented by a member of the Medici court, using milk, honey and egg yolks and nothing has been the same since. It seems almost a divine right of sorts, to deny someone the simple pleasure (even my dog) of Italy’s favorite summer treat seems almost cruel, and doesn’t factor when counting calories. Right? The exact origins date back almost 12,000 years ago with an Arab influence. Italians regularly argue where to get the best cono (cone) and us Americans just grin and go for whatever looks good. But after nine years in Italy, my senses are getting decidedly better at choosing a good spot. The general rules I have learned to abide by when seeking out good gelato was to avoid the super-colorful mounds you often see in small doorways – often on the main streets. Bright as a peacock’s tail and likely bought frozen to be sold at any number of nameless gelaterie around Italy, it is certainly not an indicator of anything good. Also I tend to avoid anywhere that sells gelato as an addition to pizza, cold drinks, panini— one must specialize in their craft, not consider it an ‘added topping.’ Lastly, I always ask if they make the gelato on-site, a good indicator of a place that doesn’t sell mass-produced goods. 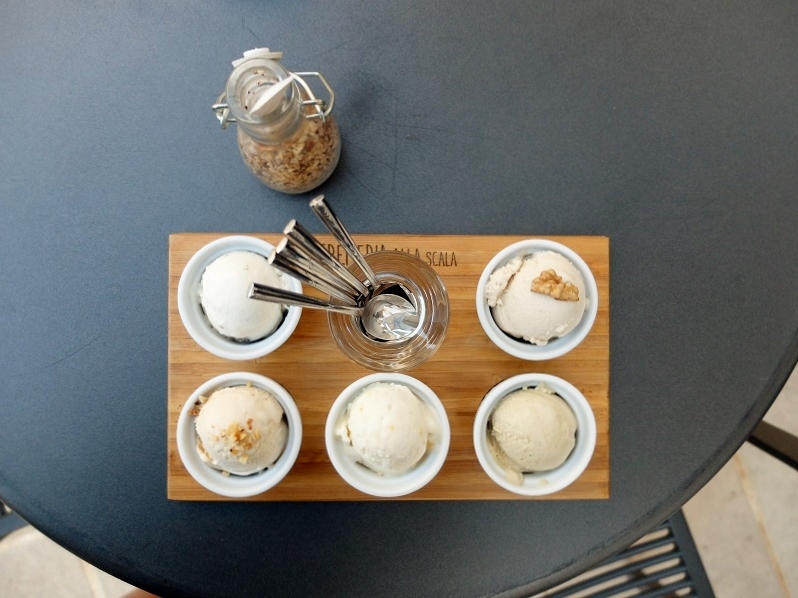 Recently, I had the chance to visit the region of Puglia with the experts over at Espressino Travel, Lili and Robert, who prefer gelato to wine and whom make it their mission to find the best local spots. One afternoon we headed to Ostuni, a small hilltop town also referred to as ‘the white city’ due to the winding, byzantine alleys of whitewashed stone, looking more like Greece than Italy. Our destination was located in an ex-fish market, Via Tamborrino, a place that once wasn’t exactly pretty but that has undergone a renovation that makes it one of the best piazzas to linger in town. The mission for the next hour or two was essentially to taste-test gelato, a hard job I know, in a place that is well-known among locals, the Cremeria alla Scala. A family affair, we met Enzo and Fabio, the exuberant father and son team who have been running this gelateria since 2003. To say they are passionate about gelato would be an understatement, this is their life and it shows in the quality of their products. We were immediately ushered into the back room, or where the magic happens. Fabio shyly smiles as he prepares a sample of raspberry gelato as we crowded inside, eager to see each poignant step. 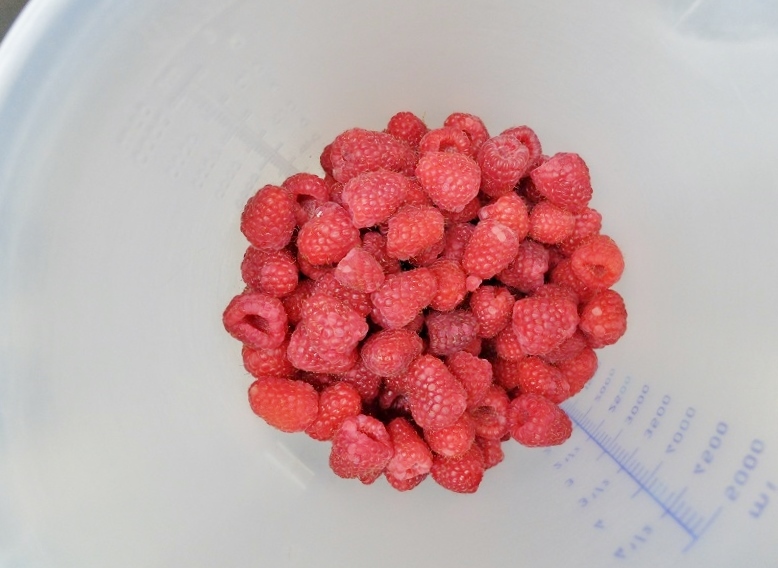 The ingredients he used were fresh, popping in a few raspberries in his mouth and offering us a few, further salivating our appetite even further. 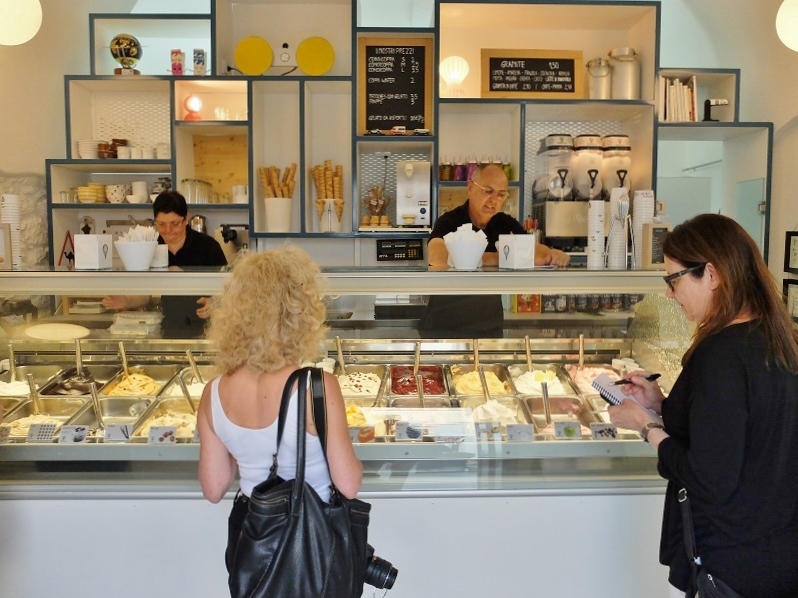 To give you an idea of what makes gelato different than traditional ice cream is the process. Less air is pumped into the mixture than ice cream, which makes the consistency a little warmer, and a lot more flavorful. Milk and sugar (but not too much) are also the prime ingredients used, and for those who wish to go dairy-free, sorbet is always a great option. Here they also offer options for those with gluten allergies, as well as other specialities including spumoni a special Italian dessert made of layers of ice cream, whipped cream, candied fruit, and nuts. A true artisan gelato-master utilizes a few natural, raw ingredients, containing no preservatives or artificial flavors or colors.I asked him how it is controlled by Italian law and Fabio shook his head and said “it isn’t.” Makers have to pay out-of-pocket to get recognition – it’s a self-controlled business. Which lends to a lot of places claiming to sell handmade goods, but that actually don’t. I ask him for additional tips on finding places like his around Italy and his face brightened “Where?” and I found out then that he loves one of the places that I regularly visit in Florence, La Sorbettiera in the lesser-known area of piazza tasso. Another favorite of mine locally is My Sugar on via de’ginori, where the passionate Alberto comes up with some truly incredible concotions like lime & sage. Fabio keeps a little map of fruits and what month they tend to be ready in the backroom. “For us it is not about making too many different flavors but concentrating on what is in season”. Mint and pistachio should showcase their natural colors (on the white side) not a garish green that is anything but natural. Ingredients at a good gelateria should be listed, and celebrated. If those working there are vague and unwilling to give you specific details, be wary. To be honest, it was an important lesson for myself, especially since I grew up with flavors such as ‘blue coconut’ and actually thinking that licorice was mean to be red. At the age of 31, I am now appreciating the concept of ‘less is more’ coming from a quantity-obsessed lifestyle, no longer do I seek a Costco-type experience, buying bulk should be limited to toilet paper. We then went to the front counter to choose flavors we wanted to try, what makes this even more special is that they offer ‘gelato flights’ (like beer) so you can try a number of their varied concoctions. Choosing was hard, as everything looked so good. Lucky for us, Enzo was also happy to let us taste basically whatever we glanced at for longer than three seconds. We settled outside, people-watching was made to happen in this cute square, where life moves happily at a snail’s pace. The standout star for me was the Sant’Oronzo, a gelato made with almonds and mandarin oranges, a taste that I can only describe as tasting Puglia itself. We left happy and full, a carnage of empty gelato pots piled up in our wake. In a world that is increasingly looking for a more refined food experience, I revel in the simplicity of visiting gelato shops like this. As I went inside to take a few pictures Enzo looked at me and said “what did you think, can I interest you in a little more, for dessert?” as he laughed. I almost took him up on it, after all why not make a meal out the only thing I really want to eat this blistering hot summer. It is very important to highlight these food artisans, people like Fabio and Enzo who display their passion in every batch. It also made for quite the sweet (literally and figuratively) touch to our visit in Ostuni. A town that shouldn’t be overlooked, but instead savored slowly. 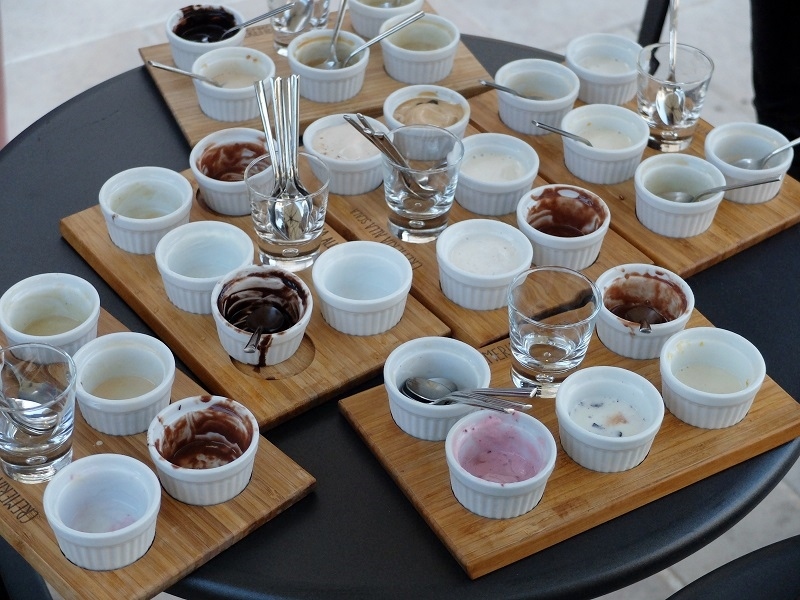 I admit this is a lot harder to do when you have one of these gelato flights in front of your face. I ate mine in about 5.5 seconds. And if you visit Cremeria alla Scala, say hello to Fabio for me.